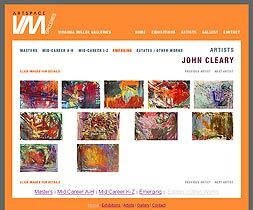 Cleary is an exuberant abstract expressionist who has had numerous solo and group exhibitions and earned several significant awards. One of the competitions Cleary won in 1977 was juried by the legendary gallerist and artist Betty Parsons, who discovered the New York School of Abstract Impressionists. About that same time, Virginia Miller brought Parsons to Miami and persuaded her to give a talk at Miami’s Metropolitan Museum. She spoke to an overflow crowd about the earliest days of one of this century’s most important art movements. “Betty Parsons had a fascinating life and is so important in American art history that she deserves an art blog of her own,” Virginia says.